Teachers, please explore these resources for implementing the RESEARCH PROCESS in your class! If you have questions, want to schedule a class in the library, or need help downloading or adapting the materials below, please contact Ms. Jenny Yamamoto (librarian). For teacher reference in support of research planning and instruction, please use the ISP TEACHING GUIDE below. 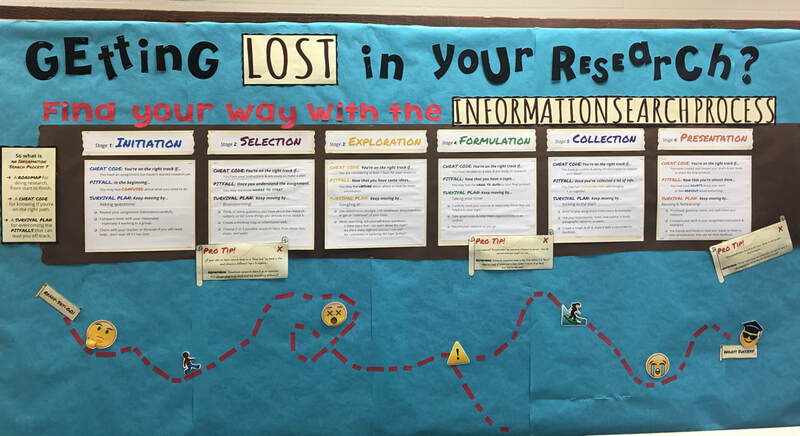 For a visual aid ​for use when introducing the RESEARCH PROCESS to your students, schedule class time in the library and request the ISP BULLETIN BOARD (seen below) to be available in the space. For student use for help with planning, organizing, and completing research projects, please download and handout the STUDENT RESEARCH PLANNER below when you assign a new research project. Note: Planner should be editable (using Microsoft Word) to customize for your needs. Did you try these resources in your class? Please consider providing feedback to the creator!